Aloe Vera is an organic plant used for the hair and skin. The clear gel inside the plant can be applied topically to the skin to help soothe the skin from sunburn, even your skin tone, and overall restoration of firmness to the skin. Aloe Vera is packed with vitamins a, c, and e and antioxidants. The antioxidant is excellent for neutralizing free radicals in the skin. 1. Soothing The Skin Of Burns: Aloe Vera is known for it's anti-inflammatory and cooling properties. Aloe Vera is best used when you have a sunburn. Aloe Vera helps the skin to retain moisture when applied. 2. Treat Acne: Aloe Vera has antimicrobial and antibacterial properties, it is one of the organic ways to help treat your acne. It contains properties such as gibberellins and polysaccharides that stimulate new cell growth, while glycoproteins reduce inflammation. 3. Reverse Signs Of Aging: Your skin will love the active ingredients found in aloe vera. Aloe vera is rich in vitamins c, a, e, and antioxidants. Vitamin c will help brighten and smoothen your complexion while antioxidants will neutralize the free radicals to help stop the rapid aging of the skin. 4. One Of Natures Best Moisturizers: If you are looking for a lightweight moisturizer that will not leave your face feeling greasy and clog your pores, aloe vera is your best bet. It will hydrate your skin and leave your skin feeling soft and looking even toned. 5. 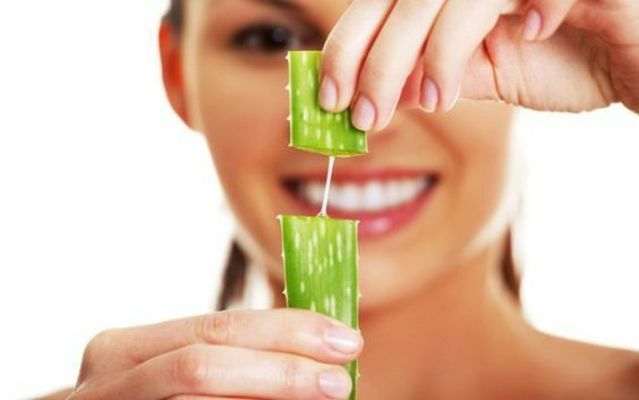 Removing scars: Aloe vera gel can help reduce your scarring. Apply pure aloe vera gel on your scar, leave on overnight; this will help fade your discoloration over time.